It’s March and Spring is in full swing here at Ticket Alternative! There are a few updates that we’re excited to share with you as we head into on-sale and festival season! Congratulations go out to our client, Minnesota United FC, who played their first MLS home opener against Atlanta United in some pretty frigid conditions. Our team traveled to Minnesota to support MNU’s box office team and braved the cold to watch the match! We’re excited to share MNU’s inaugural MLS season with them, on the road to their new stadium next year! We keep your (and your patrons’) data safe. There has been an increasing amount of attention to PCI compliance for many years now. If you’re not familiar, the term “PCI” refers to the Payment Card Industry, consisting of the major credit card brands. The intent of the PCI Data Security Standard (DSS). is to provide a consistent framework for companies to ensure they are processing card data securely. PCI compliance requires that sensitive user data, such as card numbers, be rendered unreadable either through encryption, truncation, tokenization, or one-way hashing, essentially any time data elements are stored, processed, or transmitted. There are currently 250 data safety requirements, so the process of ensuring PCI compliance is a long and arduous one. 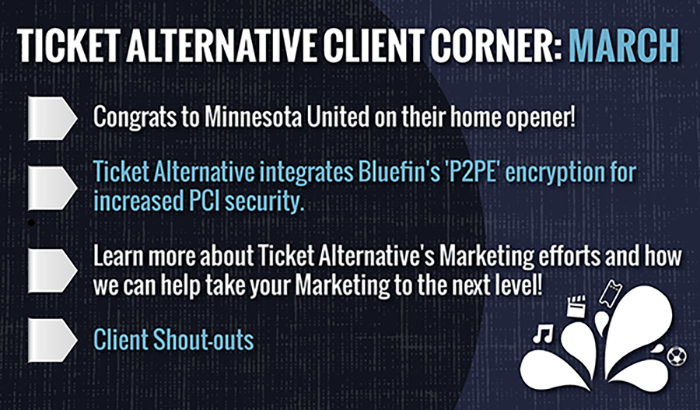 Minnesota United is our first client to integrate Bluefin’s point-to-point encryption solution or P2PE. P2PE instantly converts confidential card information into an indecipherable code and is designed to maximize the security of payment card transactions. This ensures you and your patrons are safe from hacking and fraud! Patrons can trust that their purchases are secure and you can trust we’re providing your business the strongest encryption protection on the market. For more information about purchasing Bluefin’s P2PE devices, contact Iain Bluett. The Ticket Alternative Marketing team is here to work with you on everything from customized social media campaigns and retargeting to Google Analytics. Want to learn more about how we can support your in-house marketing efforts to help you sell more tickets? Contact us at Marketing@ticketalternative.com. The Ticket Alternative Marketing team can help promote your events via our extensive social media network. Want to check out what we’re doing for our current clients? Make sure you and your team follow us on Instagram and Facebook! The 32nd Annual Firestone Grand Prix was held last week in St. Petersburg, Florida with record crowds in attendance. Kenny Leon’s True Colors theater finishes up their run of Exit Strategy on March 19. ‘Between Riverside and Crazy’ kicks off in July! The Classic Center in Athens, GA preps to host The Beach Boys! The Frederick J. Brown Amphitheater just kicked off their season with the on-sale of their Summer and Spotlight Concert Series Season Tickets. Sweetland Amphitheatre kicks off their second season with TA on March 31st with Jason Isbell! The Loft and Vinyl are hosting Sweetwater 420 (and Shaky Knees) Fest after parties!